These are programs that are helpful for use with Stitchitize products. 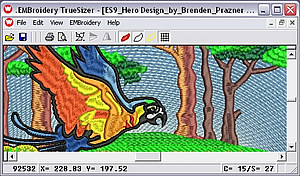 Wilcom .EMBroidery TrueSizer is a program that you can use to resize embroidery designs. You can then save the re-sized design in any embroidery format. Stitchitize Stock Designs are availabe for download in Wilcom EMB format for use with Truesizer. - Open and view and save many embroidery formats! - acheive quality Resizing with .EMB files! - generates new stitching and maintains density! Win Zip is a program that is used to combine multiple files into one single file for download. Once the ".zip" file is downloaded you can then extract files contained in the ".zip" file. Stitchitize uses .zip files when you choose our "Bulk Download" option. In this case you choose to download multiple embroidery designs and they are combined into one .zip file for download. You then need to use WIN ZIP to open the .zip file and extract the embroidery designs to your computer. Download the evaluation version of WIN ZIP for FREE. Adobe Acrobat Reader is a program that is used for printable pages. Using this progrma allows us to controle the fonts and look of printable material. Adobe Acrobat is the program that opens .pdf files. Stitchitize uses Adobe .pdf files for our instructions. You will need a copy of this program to be able to open and print .pdf files.